This week one book immediately sprang to mind and once I had it in my mind it had to be the one. Something Wicked This Way Comes by Ray Bradbury. Circus “You can get the monkey off your back, but the circus never leaves town! Double, double, toil and trouble; Fire burn and cauldron bubble. A book that I thoroughly enjoyed and my first Ray Bradbury book. Something Wicked this Way Comes (oddly, I was inspired to read this by the song in the Harry Potter film (the title of this post is a snippet of the lyrics). I love the UK book cover. I just can’t help it – it’s so deliciously dark and gothic. It makes me think of foggy streets and evil and things that go bump in the night! Scary things – Jack the ripper, Jekyll and Hyde – you get the picture I’m sure! ‘The seller of lightning rods arrived just ahead of the storm.’ I love this opening line. It draws you in immediately and piques your interest. 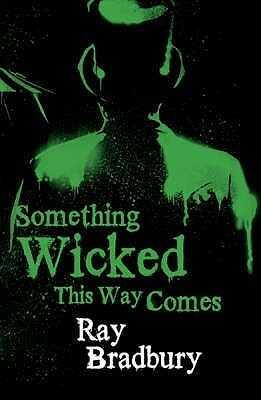 Just finished reading Something Wicked This Way Comes by Ray Bradbury which I really enjoyed. I wanted to read this book for a number of reasons, it’s on my classics list, it’s on my RIP list, I’ve also read plenty of good things about it but, in fairness, and bizarrely the real thing that kept bringing this to my mind, was one of the Harry Potter films, and I can’t remember which one, but it starts with the Hogwart’s choir singing ‘Something Wicked This Way Comes. What a strange and whimsical fashion to choose your books and yet it feels oddly appropriate with this particular novel. I really enjoyed this. It’s the story of two young boys, living in a fairly typical town. The type of boys who are usually up to a bit of mischief, albeit harmless, creeping out of their bedroom windows of an evening when their parents think they’re tucked up safely in bed to go and play in places they shouldn’t really be and to conjure magical adventures. Then, on one such evening, the carnival comes to town and the boys become involved in something much more sinister than they ever imagined. A fight for life in fact. Firstly, a note on the author’s style of writing. Fantastical is probably the best description that I can come up with. The prose are almost poetic at points and strangely evocative. The author definitely has his own style but as soon as I’d become accustomed to this I was totally drawn into the story. Will and Jim are the two main characters. Both rough and tumble, best friends. Jim borders a little more onto the dangerous and darker side and it’s this side of his nature that draws him to the carnival and brings him to the attention of the strange performers. This carnival isn’t of the everyday. The illustrated man is not all he seems and many of the performers are held in a strange and subdued captivity. There are so many interesting characters and concepts here. The witch, and particularly her strange form of magic, the whole scene with the hot air balloon was really quite freaky. The carousel – well, all I can say is I don’t think I can ever enjoy a ride on one of those again! The maze of mirrors – I must admit I find the Hall of Mirrors in any fairground a bit unnerving but this particular maze magnifies that feeling. This maze reflects the person’s darkest fears a thousandfold. I’m not going to go into too much more detail. The story was undoubtedly creepy. The plight of the boys reaches a great dramatic climax. It’s a great look at good and evil and the different shades in between and the strange nature of people that draws them sometimes to things that are dark and supernatural. On top of this it’s one of those stories that you read and can immediately feel that it’s had an impact on other writers. And finally, it’s a wonderfully dark and perfect tale to read on an autumn night leading up to Halloween. I’ve read this for Stainless Steel Droppings RIP event. This also counts to my Classics Club list.